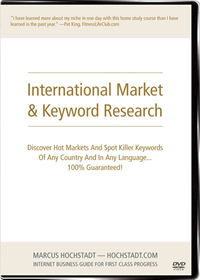 Discover Hot Markets And Spot Killer Keywords Of Any Country And In Any Language… 100% Guaranteed! Starting an Internet business without proper research is like opening an offline store without investigating the market potential and its “monetizability” first. While we would not do this in the offline world, why do so many people start an Internet business without doing proper research first? Do you know the market potential of your product ideas? Do you know which keywords visitors enter into the Search Engines and how many? Do you know what to write about so that Search Engines deliver visitors over and over again? In case you ever researched markets and keywords, you certainly used one of the countless keyword tools available. Did you know that some of them do not deliver reliable results, or that most focus on the US market only? Why leave money on the table? With the Home Study Course I’m releasing today—International Market & Keyword Research—you can finally discover hot markets and spot killer keywords of any country and in any language… 100% guaranteed! Thank you for giving me the opportunity to view these videos. The videos were extremely helpful to me. Over the last year I’ve had “gurus” tell me about these tools, but apparently had no idea exactly how they worked and the extent of the information that I could get from them. Simply put, these videos have taken all the guess work out of market research and have provided a very realistic and easy to understand approach to market research with keywords. Instantly after watching them I started applying what I had learned and have in turn learned more about my niche in one day than I have learned in the past year. Thank you for taking the time to thoroughly explain these tools in these easy to comprehend videos! I went through your videos and really like them. You provided a lot of good information that even someone with very limited knowledge would be able to follow along. The sound and video quality was great and I enjoyed going through them all at once. I am sure with some playing around it would be neat to target and geotarget certain keywords to be shown up on a blog or website. I enjoyed your course very much. I liked your in-depth look at free tools that people can leverage and assess online market potential as well as select relevant keywords. Your introduction made a case for research, and I was lead to believe that the course would be for beginners. Once I got into the body of the course, I realized that it is also valuable for professionals. I have experience, so I found your course very valuable, because it took me to places where I hadn’t gone before. Until noontime on Monday, June 30 (PDT/GMT -7), you can get the DVD International Market & Keyword Research for $35. After this special, the price will go up to $100. I did not get a chance to see he videos, but I did have a coaching session with Marcus where he went over several of the concepts and tips that are included in these videos. Knowing Marcus (and based on the advice and training he gave me during our coaching session), you certainly can’t fail to learn something new by trying out this course. If this can help me build a business to the point that I can live at least half the year abroad, count me in. You’re so right that people don’t do their market research before buying a domain name. It’s almost like companies such as GoDaddy are sitting there, preying on budding entrepreneurs who haven’t taken the time to do their homework properly. Domain names can be irrelevant though. Once a site has really done a good job at SEO and building recognition I feel that it doesn’t really mean that much outside of having something easy to remember. I mean look at wikipedia and others. Noticing a trend. No urls that have weight loss in the main urls. You can do this for anything and get the pretty much the same results. BTW – These DVD’s are awesome! I thought I had a grasp on my research until I watched these. I had no clue! Great job on this Marcus! Thanks for bringing that up, Pat. It is right that you’ll find Web sites in Google’s Top 30 that apparently do not have the main keyword in the domain name. We need to keep in mind that the URL (i.e., domain name plus what comes after it) makes up to 20% of the ranking factors. On-page and off-page criteria make approx. 40% respectively. That means that those who did not search engine optimize their URLs but ARE in the Top 30 in highly competitive areas, they usually have thousands if not tens of thousands of links from other site’s to theirs (one-way links, that is) and eventually also their on-page factors straight. That means in return when you also have the above 80% straight PLUS your URLs search engine optimized, you do have a 20% advantage above your partners or competitors. I’ve just published your article on the most recent Get International Clients Sunday Blog Carnival. Come by to vote on the best post of the 31 posts this week. Use the social media of your choice to help get traffic back to your site. I stumbled this post. The first stumbler in fact. You are completely right, it’s impossible to start any internet business without some researching in this area. Very useful post.